Android™ App available for the ever popular Octava Video Over LAN systems. - Video Over IP and HDMI Video Connectivity Solutions. Android™ App available for the ever popular Octava Video Over LAN systems. 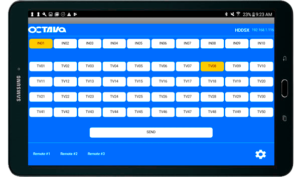 Octava customized Android™ App available for the ever popular Octava Video Over LAN systems. As part the Octava Video over LAN solutions , Octava engineering services will work with qualified customers to customize the Android App for your system so it is easy for your team to operate. Ideally designed for video system for restaurants, sports bar and other public facilities requiring multi-screens.